Tara Jensen, founder of Smoke Signals Bakery, has a message for her readers: Unplug, breathe in, and connect. Her recommended practice? The simple act of going into the kitchen and kneading dough. 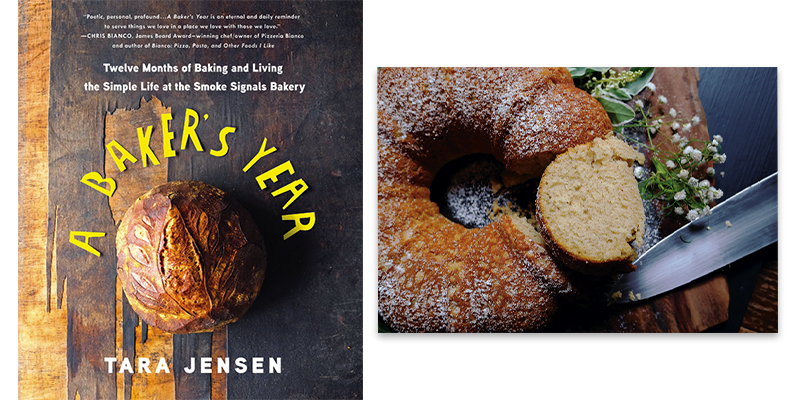 Jensen’s new cookbook, A Baker’s Year: Twelve Months of Baking and Living the Simple Life at Smoke Signals Bakery (St. Martin’s Griffin, 2018), releases in February and tracks the seasons at her Marshall bakery, offering an antidote to our fast-paced realities. The book begins in January, as Jensen describes varieties of grains and their properties, and ends in December, with cake recipes for the winter solstice. Other recipes are included for each month, like March’s brightly flavored lemon poppyseed pancakes, May’s hearty ploughman loaves, and August’s herb- and berry-filled Shooting Star Cake.